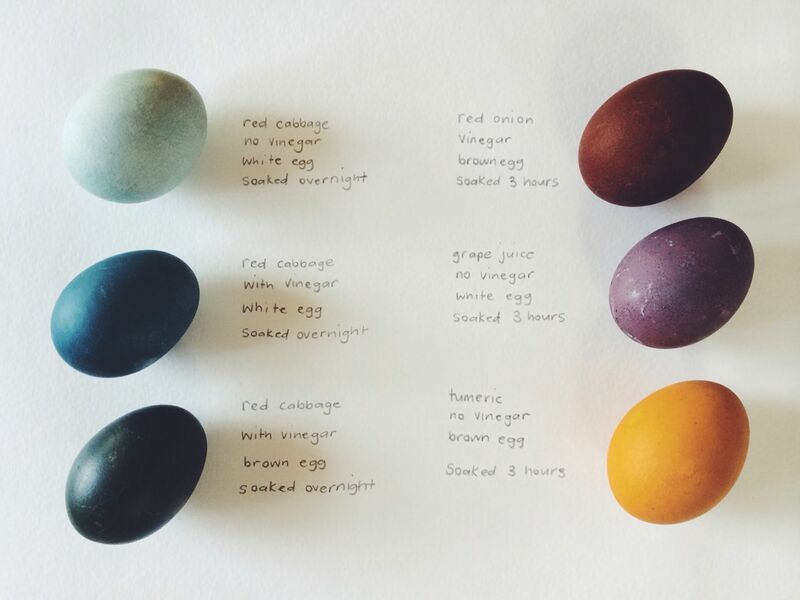 There is a beauty and depth to naturally dyed eggs that gives you a connection to easter and the time of year it falls. The colours that are achievable and easily available through natural dyes are the same colours evident in the flora occurring (for us) in the natural environment. The colours and tones echo each other and it is nothing less than divinity. To be whiteness to this, to be aware of this, is what makes life feel full and whole. It is simple really. It is about celebrating with grace and ease. Not ease in effort, but because it is natural, and this helps us rest at ease that we are doing it right. Above is an example of our dye experiments. I love vibrant eggs, and they take patience! Overnight soaking is required and we have come to accept that waiting for good results is part of the process. One must also accept that your home will smell like cabbage and onion and turmeric, and as I said to Cam, it is good for us, the smell wakes up our senses! I boil the eggs in the dye solution. I start with a cold egg and cold liquid dye solution and cook the egg for 12 minutes. At some point it will boil. Then let it cool/rest in the strained dye solution. We like to eat the eggs, so that is why I cook them this long, so that they are perfectly hard boiled. I refrigerate the egg as soon as the liquid is cool, and let them sit overnight in the fridge in the solution. You can read more about our journey with making natural dye here. Free range eggs in both white and brown. Red onion skins (I did not buy a heap of onions. I fossicked through the onion bin and filled a bag with the fallen off shells). 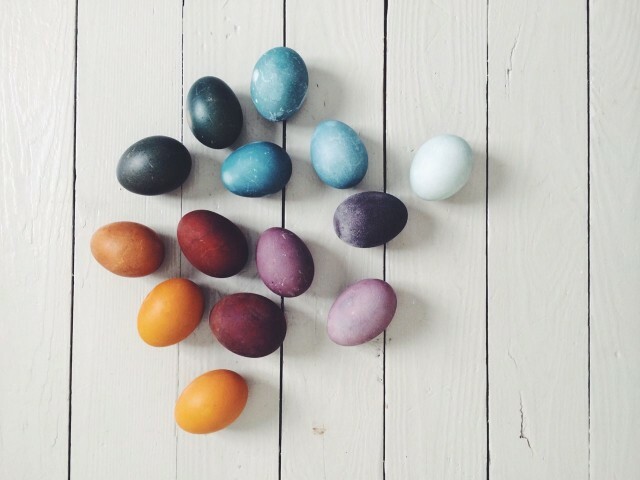 This entry was posted in C E L E B R A T E and tagged easter, easter eggs, naturally dyed eggs. 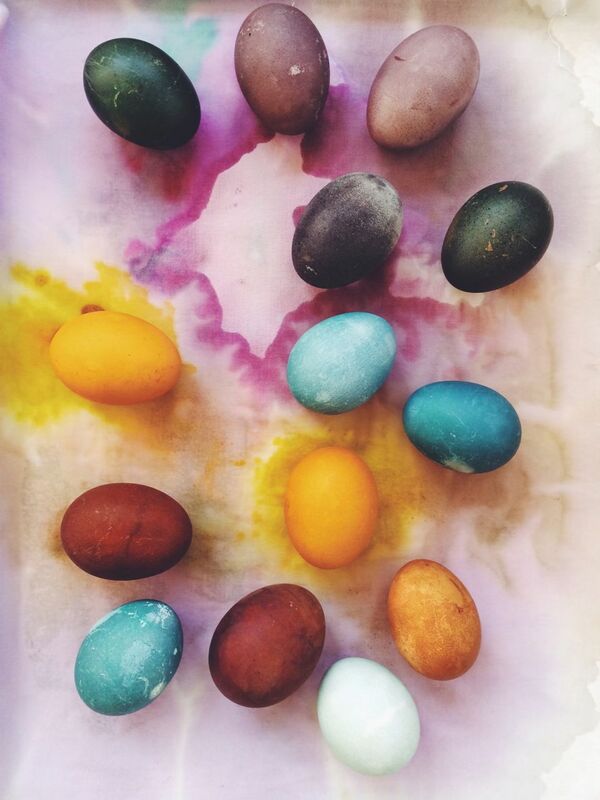 My Mum used to rub the dyed eggs with bacon for a nice glossy shine. 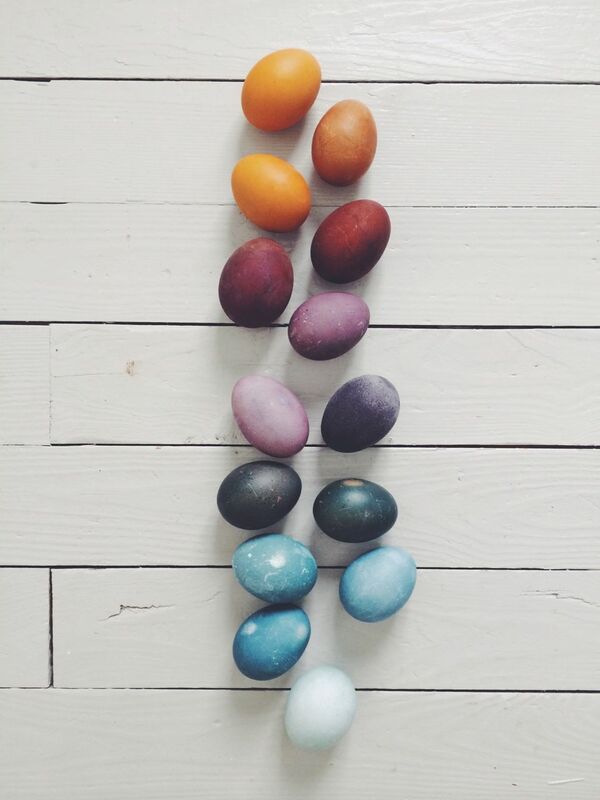 I love your results and just decided, that I need to dye some easter eggs this year, too. My mom would wrap the eggs with the onion skins, red, white, yellow, (individually) and boil them, like colors with like colors. She used old, cut, t-shirt squares from dad’s drawer, to wrap them with , tied the tops with rubber bands, and steeped them until she thought the colors were good…20 or so minutes. Each onion skin color produced something different, green, yellow, browns, mottled and so pretty and organic. Not sure if she used vinegar, plan to for mine this year. Colors of yours seem so vibrant. I do this every year as a family tradition, have nieces and nephews, and grand nieces and nephews to teach now. Happy Easter! PS Mom learned this from her mom, in the tiny Florida Beach town where she grew up. 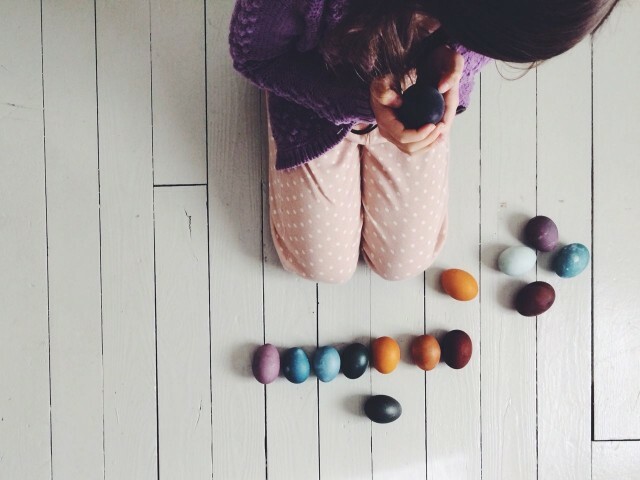 Thank you so much for sharing, I love this little snippet of your family easter traditions! Our dear grandmother, Nana, was from Hungary, and came to this country in 1910. We loved her Easter eggs. Before dying them she would fasten parsley leaves and other pretty leaves and small flowers with an old nylon (or silk stocking) tied to keep the decoration in place. The egg was then dyed with onion skins like your recipe. I would plant wheat in wetted vermiculite about 10 days before Easter in the kids baskets (line first with plastic wrap). We loved Easter! Thank you so much for sharing your family story! Do you think this would work with wooden eggs? I could not say for sure as I have not done it my self, but I think some of the dyes would stain wood beautifully. That would be fun to try! They are beautiful! Can you eat them after or are they just for decorations? You can eat them if you have stored them in the fridge! Hi Kirsten, what a beautiful result you achieved! Can you do this method with blown eggs? Oh how clever my children will lov doing this . Could u poss supply a further list of ingredience that could be used to achieve more colours. I guess beetroot is one that could work and tea perhaps? 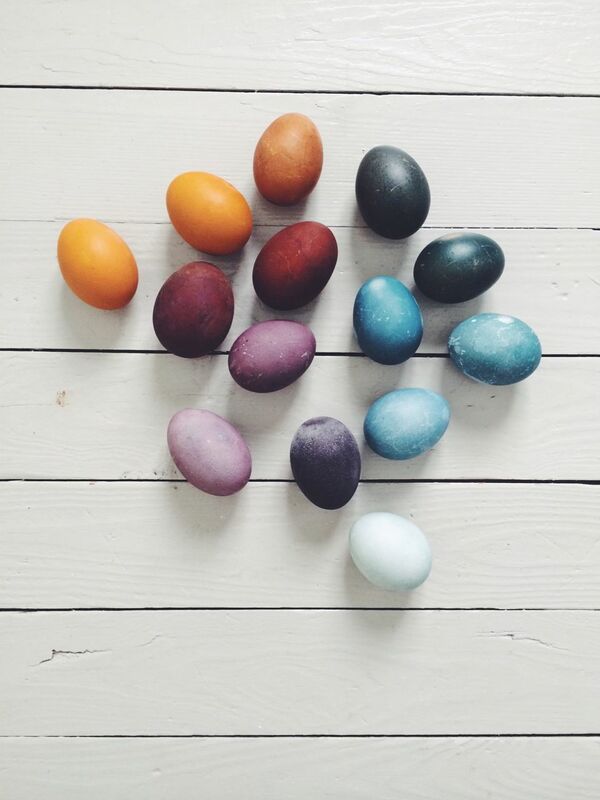 Pingback: 10 Ways to Dye Easter Eggs!